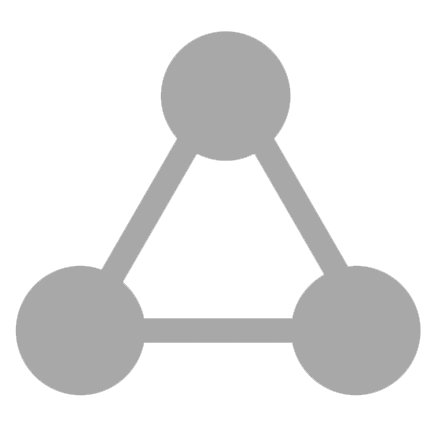 The Badminton Drop has 2 variations; the Fast and Slow Drop. First, I’ll quickly explain what a Drop Shot is. It is a soft badminton shot performed from the Rear Court. It travels down steeply and land at your opponent’s forecourt. 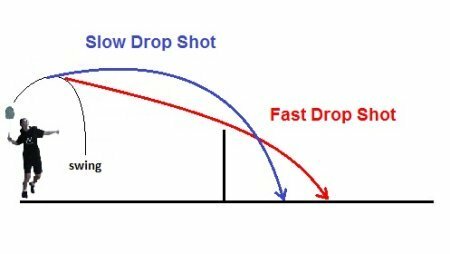 Generally, there are 2 types of Drop Shots. Fast Drop Shot: Travels down steeply. But lands further away from the net. Slow Drop Shot: Does not travel down steeply. But lands nearer to the net. Whether it’s a Slow or Fast Drop Shot, a good quality badminton drop will have the shuttlecock passing JUST SLIGHTLY ABOVE the net. As a beginner, don’t worry too much about doing the perfect drop first. Learn the correct technique of performing a badminton drop, and then practice to make it perfect. For the Fast Drop Shot, the shuttle will land somewhere on the YELLOW area below. It’s called the Fast Drop because the shuttle travels down faster to your opponents side, but lands nearer to the mid court. Ideally, the Fast Drop will land on or after the service line. For the Slow Drop Shot, the shuttle will land somewhere on the RED area below. We call it the Slow Drop because the shuttle takes some time before it lands on your opponent’s side. However, it will fall nearer to the Net. A good Slow Drop should land before the service line. Get your opponent our of position. The Drop Shot draws your opponent to the front of the court. A good drop could disrupt your opponent’s footwork. Variate the pace of the game. This is a popular strategy. When used at the correct time, the Drop can be very deceptive. The key is to hit the Drop when your opponent expects a Clear or a Smash.You can then expect your opponent to return a weak shot; hopefully returning the shuttle to your mid court. The Drop Shot (both Fast and Slow) can be performed using the Overhead Forehand and Overhead Backhand Stroke. How to Hit the Overhead Forehand Drop Shot Learn the correct technique for the Fast and Slow Drop Shot using your Overhead Forehand. Very useful in both singles and doubles. How to Hit the Overhead Backhand Drop Shot This shot becomes very useful when your opponent hits the shuttle to your backhand area. I suggest you to learn only the Fast Drop for your Backhand Drops because the Slow Drop requires some slicing. Slicing is a very difficult technique and I wouldn’t recommend you to slice if you’re a beginner. How to Hit the Slice Drop Shot If you are the ‘master’ at the Fast and Slow Drop, you might want to bring your skills to the next level. The Slice Drop Shot allows you to further deceive your opponents. You’ll also learn how to use the slice to hit better quality Slow Drops. Does the cross court Slow Drop sounds appealing to you? Click in to see how! “Everyone knows how to hit a smash. Many players can hit good smashes. But not many players can hit good Drops. the shuttle might end up getting caught by the net and you lose a point. the shuttle might pass over too HIGH above the net.